Why book with NZ Shore Excursions? How do I book a New Zealand shore excursion? When will I receive my confirmation email and voucher? What do New Zealand shore excursions include? What happens if the ship is late or can’t make it into port? 1. Why book with NZ Shore Excursions? We know your time in port is an important part of your New Zealand experience, so NZ Shore Excursions is committed to delivering great shore excursions. 2. Is there a risk I'll miss the ship if I don't book through the cruise line? No. The cruise lines would like you to believe that independent tour operators carry this risk, but we are well aware of your ship's departure time, and our New Zealand tours are designed to get you back to the ship with time to spare. In the extremely unlikely event you were to miss the ship due to one of our tours, we guarantee that we will pay the full cost of your meals, hotel, and transportation to the next port of call, and we will handle all of the arrangements for you. 3. How do I book a New Zealand tour with you? If you know which tours you want to take, you can book them online with NZ Shore Excursions – it’s simple and fast. If you require more information, or would like help planning your New Zealand tours and activities, please contact us. 4. When will I receive my confirmation email and voucher? You will receive a confirmation email and tour vouchers shortly after you complete the online booking, this will also include instructions on how and when to meet up with your guide for each tour. 5. When should I reserve my shore excursion? Because some tours sell out quickly, we recommend reserving your New Zealand excursion as far in advance as possible. 6. How close to the tour departure can I make a reservation? We require you to make a reservation at least three days in advance of your cruise ship's departure, this way we can ensure all the necessary arrangement have been made before you leave – for your peace of mind. 7. What do shore excursions include? NZ Shore Excursions provides transportation, meals & refreshments, guides, and entrance fees as indicated in the individual tour descriptions. Each tour description specifies the recommended attire; however, travellers should always wear comfortable shoes and bring plenty of sunscreen, a sun hat and sunglasses for those hot summer days New Zealand is famous for. 9. How much physical activity is involved in the tours? This depends on which New Zealand tour or activity you select. Minimal Physical Activity: Light walking and no major climbing required. You may need to negotiate a few steps. Moderate Physical Activity: A fair amount of walking is involved, and you may need to climb up full flights of steps and/or negotiate uneven terrain. Significant Physical Activity: A large amount of walking and or climbing is required, often over unpaved and uneven terrain. You should be in good physical health if you reserve one of these tours. Please refer to the specific tour descriptions to see which category applies to the tour. If you have more specific questions, please contact one of our New Zealand Shore Excursions experts. 10. Where do I go to start my tour? Your booking confirmation will contain clear instructions on where and when to go to meet your tour guide. It will also include instructions on what to do in the very unlikely event that you encounter difficulties finding the right location. In most cases you can cancel a tour up to 14 days in advance of the tour departure and receive a full refund – just contact NZ Shore Excursions. Each individual tour description will include any variances on this policy. Once you are within the 14 day departure window, the tour becomes non-refundable – our operators have set aside space to accommodate your request and will often not be able to fill that space with another customer so close to departure. 12. What happens if the ship is late or can’t make it into port? You will receive a full refund if you cannot make a tour departure due to a ship delay or a missed port call. You will also receive a full refund if weather or an equipment problem prevents the tour from taking place. 13. Am I expected to tip the Guide/Driver? Tipping your guide or driver is strictly optional but greatly appreciated. 14. How do I make changes to my tour reservations? If you need to make changes to your reservation, or to cancel a tour, please contact one of our New Zealand Shore Excursions experts they will be happy to assist you. 15. Are children's prices available? Yes. Many of our New Zealand tours offer prices for children under the age of 12 years. Toddlers aged 3 and younger, sitting on a parent's lap (i.e. not occupying a seat), are free for most tours. Please see the individual tour descriptions for more pricing information. 16. Are there any age restrictions on tours? For most tours, there is no minimum age for children as long as they are accompanied by a parent or guardian. Guests under the age of 18 years are not permitted to participate without a parent or guardian. In some cases, an unaccompanied minor may be permitted on a tour if a wavier is signed by the parent. 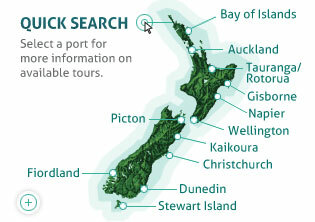 Please contact NZ Shore Excursions for details on specific tours. 17. May I take more than one tour in a single port of call? This is dependent on the length of time you are in the port and also on the length of the tours you wish to go on. We would be happy to discuss your requirements – just contact NZ Shore Excursions for more information. 18. What do you recommend for physically challenged passengers? Each tour description includes restrictions – please refer to these for more information and recommendations. However, for passengers able to walk on their own, we recommend tours designated as requiring a low level of activity. The transportation on some tours may be able to accommodate a collapsible wheelchair stored below the bus; however, scooters or motorized wheelchairs are often too large to be transported. If passengers are unable to walk, we would recommend independent transportation for their comfort and convenience. Our New Zealand Shore Excursions experts are happy to suggest suitable tours. We also recommend that non-ambulatory passengers be accompanied by someone who is able to assist them throughout the duration of the tour.